“Every journey into the past is complicated by delusions, false memories, false namings of real events,” wrote the poet Adrienne Rich. There is probably a photograph of a family event from your childhood, an event that occurred too early in your life for you to have remembered, and yet, because of its ubiquity, your sense of it is as memory, and it is part of your story of yourself. There are also stories that evolve from mere tellings of this-then-this-then-that into artful narratives we subconsciously hope will evoke deeper empathetic reactions from those we tell the stories to. One of the best explorations of family stories is Sarah Polley's 2013 documentary Stories We Tell, about the messiness of life lived and the deep need we have for narrative to impose order on memory so as to give experience meaning. Polley tries to tease out the "truth" of her mother's intimacies using home movies, family snap shots and re-enactments interspersed among contemporary interviews with relatives and family friends. What emerges as each teller's perspective accrues is an ever-widening kaleidoscope of conjecture and construal. Polley's story does not exploit her mother's, but pays tribute to it and respects its mystery. Each of us is ordinary and mysterious, each harbors secrets. Louder Than Bombs is Norwegian director Joachim Trier’s first English-language film. It is something of a movie making anomaly these days in that it is not based-on-a-true-story, a biopic or adapted from a story or novel. Trier wrote the original screenplay with Eskil Vogt, who co-wrote Trier’s previous films, Reprise (2006) and Oslo, August 31st (2011). 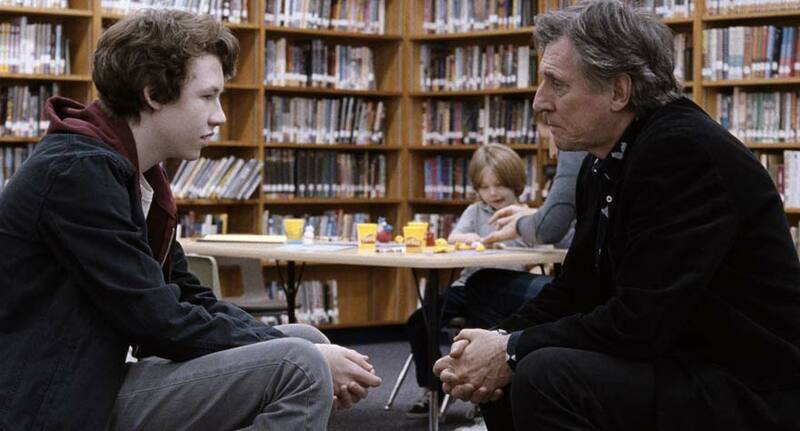 Much like Polley’s documentary, Louder Than Bombs circles the mystery of its central character. Isabelle Reed (Isabelle Huppert) is a deceased conflict zone photojournalist for whom the New York Times is preparing a major retrospective. The narrative operates on a sort of double helix. On the one hand, there are the ethical questions the photojournalist herself had about the motivations for and execution of her work. Can her photographs reveal the human truth of her individual subjects, or do they merely serve as beautiful but stock examples of those living in war-torn regions? Does her eye, in the very process of framing the shot, manipulate the image and make it less truthful? Her creative dilemma is one that the documentarian Errol Morris has been exploring throughout his directorial career, in his book Believing Is Seeing and in his many essays, among them for the New York Times’s “Opinionator” series. Morris insists, “If you think you're going to create an unposed photograph, think again. There is no such thing.” We might conclude that the struggle to find truth is an inevitable impossibility, yet the irony is that we can glimpse it through the creative lens of imagination and mythmaking, that very manipulation that is art. Isabelle’s older son Jonah (Jesse Eisenberg) explains how much he learned about visual composition – and by extension narrative composition – from his mother’s work, through what she determined to leave out and to keep in the frame of the photograph. Indeed, it is her family's various frames of reference by which they placed, place and will place themselves into the context of their evolving understanding of Isabelle as secrets emerge. So, too, on the other hand, there is the dilemma of family secrets, and if not lies, then omissions. Isabelle has left behind a husband, Gene (Gabriel Byrne); a son, Conrad (Devin Druid), who was on the cusp of his teenage years when she died; and Jonah, who was in graduate school. Conrad has always been led to believe his mother died in a tragic highway accident, which he imagines in various iterations. Not only are fragments of memories – real and imagined – explored from different perspectives, but fragments of points of view as the film eddies around Isabelle’s creative dilemma and the family’s dilemma in relation to her. A variety of flashbacks plumb, on one level, the problem of memory, and on another, the experience of the here and now, which has an equally multivariable quality depending on a character’s point of view. There is Isabelle’s first person point of view juxtaposed with each family member’s memories of her as wife and mother. Then there is the question of the efficacy of immediate experience when a scene of the father surreptitiously following Conrad, worried about the boy’s state of mind, is repeated from Conrad’s point of view in an entirely different telling. There are also Conrad’s stream of consciousness diaristic musings that give Jonah new insight into his younger brother’s inner life, and Jonah’s warning against Conrad’s desire to share them with a girl at school because, Jonah cautions, she will not understand them for what they are. Others characters exist on the periphery: Jonah’s wife, Amy, who has just given birth to their first child; his old girlfriend, Erin (Rachel Brosnahan); and Gene’s colleague and lover Hannah (Amy Ryan) – all of whom possess insufficient insight to avoid mistaken assumptions. Wonderful review. I always learn much more from you than just the plot and thumbs up or thumbs down. Another Kempf philosophic story-telling masterwork. And now I have to see the movie to compare my subjectivity to her subjectivity, with me as close to being objective as possible. Edward Rubin, New York City fellow writer and cineast.